Under normal circumstances, the sinuses produce a scanty amount of mucoid fluid. When inflammation sets in, as a result of allergy or a common cold, the mucosal lining produces a profuse mucoid drainage. Inflammation makes it easier for bacteria to infect the sinuses. As a result, pus accumulates inside the sinus cavities. Symptoms consist of severe pain and tenderness over the involved sinus. In maxillary sinusitis, pain is over the cheek and the upper teeth. Frequently, the pain is mistaken for that of an infected tooth. In ethmoid sinusitis, the pain is between the eye and the nose, or deep behind the eye. 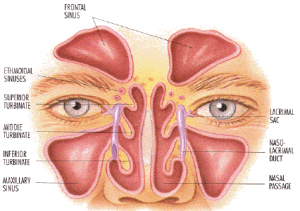 In frontal sinusitis, the pain is in the forehead. Finally, in sphenoid sinusitis, the pain is deep behind the eye, in the temple or even the crown of the head. Discharge from the sinuses, a blocked nose and an inflamed throat can occur because of the post-nasal drainage. If the sinus cavities are blocked by a swollen mucosal lining, pus cannot escape into the nose and pressure builds up inside the sinus cavities. Pain becomes unbearable, and the infection may extend outside the walls of the sinuses, causing facial or orbital swelling. At Back to Health we can help with sinusitis! Dr. Barbara Rodwin can treat your sinuses with the use of a laser, and/or acupuncture, show you how to drain your own sinuses and how to alleviate sinus headaches. 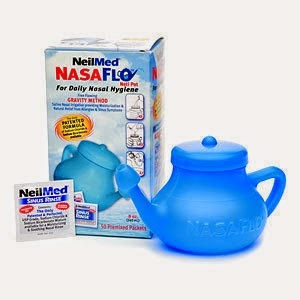 Also Neti Pots or a product known as Neilmed sinus are very effective for flushing irritants our of the sinuses. A Neti Pot is filled with warm, slightly salted water and the spout of the pot is inserted into one nostril. The position of the head and pot are adjusted to allow the water to flow out of the other nostril. The Neilmed works on the same premise but it is a plastic bottle and you use a packet of salt that is supplied with the product. Asthma is a common condition that’s anything but simple. Symptoms vary widely from person to person and from situation to situation. Every year, about 500 Canadians die from asthma. Most of these deaths, however, could have been prevented with proper education and management. Asthma is defined as a “chronic inflammatory disease of the airway” that causes the following symptoms: shortness of breath, tightness in the chest, coughing, and wheezing. People with asthma often have trouble breathing when they’re in the presence of what are called “triggers.” When someone with asthma has asthma symptoms, it means that the flow of air is obstructed as it passes in and out of the lungs. 1. 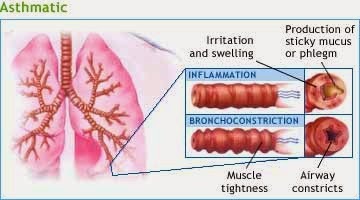 Inflammatory Triggers are the allergic triggers which cause inflammation of the lungs’ airways or tightening of the airways’ muscles. Inflammatory triggers include: dust mites, animals, cockroaches, moulds, pollens, viral infections, and certain air pollutants. 2. Symptom Triggers are the non-allergic triggers which generally do not cause inflammation, but they can provoke “twitchy” airways, especially if they’re already inflamed. Symptom triggers include: smoke, exercise, cold air, chemical fumes and other strong-smelling substances like perfumes, certain food additives like sulfites, certain air pollutants, and intense emotions. Most people with asthma can live full, active lives. The trick is learning how to keep the asthma symptom-free. If you have asthma, you can control it: by avoiding your asthma triggers, by taking your medication, through education from your healthcare team and by following an asthma action plan. Your medical doctor will possibly refer you to a specialist or an asthma educator and suggest you use a peak flow meter to monitor your lung function. This allows you to note any changes that might mean your asthma is not being controlled properly. 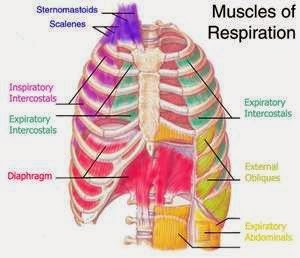 Also with asthma you end up using your accessory muscles, ribs and thoracic area more – see article on: What we use to breath. 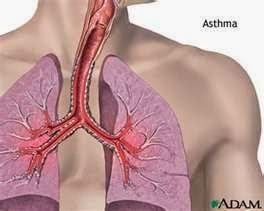 If you have these areas treated with chiropractic adjustments, massage and active release technique you can lessen the breathing issues associated with asthma. There are numerous types of allergies an individual could have. You could be allergic to: pollen, moulds, dust, perfumes, colognes, cleaning products, chemicals, other environmental allergens, and many types of foods. They can affect you in different ways such as: aggravating your sinuses, causing breathing issues, sneezing, frequent colds, ear problems, mucous build-up in the throat, and digestive issues. Allergies can be helped by eliminating the allergen, and by building up your immune system. There are certain vitamins, minerals and homeopathic remedies that can be taken to help with this. Please ask Dr. Barbara Rodwin regarding use of the supplements. Also you can take a sensitivity test that will look at all the allergens and this test allows you to know how sensitive you are to the different allergens. There are two centers in Ottawa that test for all the food and environmental allergens. If you are interested in having these tested just ask us for the cards!